Special Offers from Discount School Supply®! : Dollar Days are Back! Dollar Days at Discount School Supply are here again! Colorations® Liquid Watercolor Paint, 8 oz. This customer favorite is only $1! 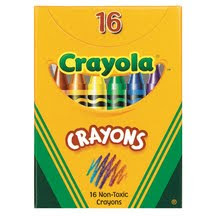 Crayola® Regular Crayons - Set of 16. All the classic colors for only $1! Colorations® Washable Sidewalk Chalk - 20 Pieces. A full bucket for only $1? That's 74% savings off the retail price! Large Elmer's® Glue Stick, .77 oz. - 1 Stick. Smooth application with Elmer's® quality. Only $1! Find more Dollar Days deals right now at Discount School Supply. But you need to hurry because these products are only on sale until March 21st! Discount School Supply is the best place to shop for your classroom and early learning essentials. Save big bucks every day on Arts and Crafts, Furniture, Curriculum Resources, Manipulatives, Active Play, Dramatic Play and more at Discount School Supply. And for a limited time, save even more with the Discount School Supply Dollar Days. Hurry! Don't miss out on your chance to stock up for the Spring and Summer. Click here now to find more great Dollar Day deals from Discount School Supply.